Over the last few weeks I’ve been working on sliding shelves for the small pantry area in the motor home. Until today everything was going along nicely because I was wound-free. Now, I’m talking about weeks, folks, not just days or hours, of managing to remain relatively waterproof (no blood loss) and no detectable bruises. 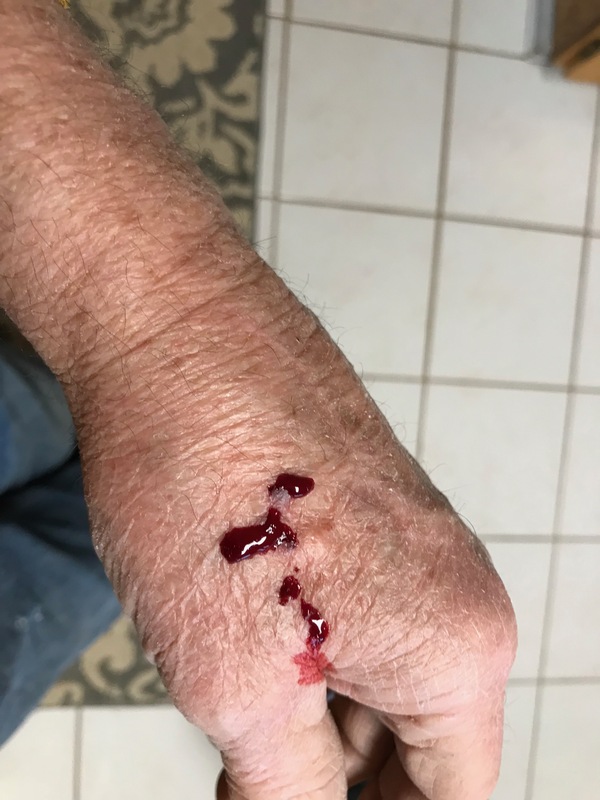 I attribute this to the fact that all I needed to do was slow down and pay attention to what I was doing – just like Diane has told me to do numerous times subsequent to pretty much every previous injury that required her assistance to mend. The project was to build 5 sliding shelves that are 6 11/16” wide and 20” inches long. Not very big and something an expert could probably hammer out in a few hours. I, however, must spend numerous hours considering how I should proceed. I do that a lot for everything I do that involves a task that requires a finished product. Generally, I do that for so long sometimes that Diane doesn’t think I’m doing anything at all. I suspect she thinks I’m napping but what I’m really doing is staring at my stash of lumber, draw guides, and tools attempting to visualize what the shelves will look like when done. I’ve already researched possibilities on Pinterest and found about a gazillion choices to use, but most of them don’t supply the detail I need get going. You know, of course, that analyzing a gazillion references takes a considerable amount of time and that happens before I stand in my shop and start the visualizing process. Glue Only – this method is obviously totally impractical, even though the glue I have requires a considerable effort to break apart pieces that have been allowed to cure for the proper amount of time. You see, I like to take things apart, to, and gluing kind of rules that out for things that are constructed with wood that’s been measured once and cut twice. It always needs to be fixed at some point. So, no glue. Nail Gun – this method is very appealing because I hardly ever get to use my nail gun because they are illusive critters. I had three of them at one point in time then I had none and I had no idea where they went. One of them was finally located when I asked Jeff if he borrowed them and he said he did. Then one day our old neighbor, who moved last year, came by with a box containing one of the other guns that I’d loaned him and forgot about. He said he was going through boxes in his garage and found it and decided he should return it. The third one is just gone. I can only hope it found a good home. Prior to the neighbor returning the one I loaned him I went to ACE and bought a new one so now I have two again and have access to a third one that Jeff has, should I need it. I won’t need it, however, because it’s for nailing large boards together and I’m working with little stuff. Another issue with nail guns is they need compressed air to work and my compressor is big and resides in the garage. It’s noisy, too. Whenever I fire that puppy up Panzee, a dog who is essentially deaf, runs away. I do, however, have a portable air tank that will hold 100 lbs of air. It’s located right next to my table saw, which has been the source of some colorful injuries I’ve documented in previous posts. So, the nail gun became a viable candidate for part of the construction as long as the air holds out. I know from experience that getting the empty tank to the compressor is a cinch but lugging it back to the basement filled with 100 lbs of air is really hard. Screws – these were essential for mounting the drawer glides to the inside of the cabinet and to the shelves. I knew this was true immediately when I got the glides because the screws came with them. Thankfully, I have a portable electric screw driver. Actually, it’s a portable drill but I can drive screws with it, too. The problem with it, however, is that it’s a wee bit too long to actually drive screws in a space that’s not much over 6” wide and 20” deep. So, I pulled out one of my really old rechargeable electric screw drivers the kids bought me about 10-15 years ago. I figured the battery was probably toast but was pleasantly surprised that it charged right up and served me well during construction. I cut pieces of wood to which I screwed the drawer side of the drawer glides. In the cabinet I installed spaces to attached the cabinet side of the glides. The spacers were needed so the shelf would clear the opening. Then I cut six shelves out of random pieces of paneling and peg board material and attached two guides to each of them with my nail gun. Viola! I had shelves. But, the tops were just flat with no sides to contain items. Then I had an epiphany, which is always fun. Epiphanys that I have never just jump out of the blue to me. They come to me after lots and lots of time consuming thought about how to solve something. It’s a gradual thing for me which, I know, is kinda contradictory of me calling them epiphanys. But they are, and I always enjoy them. In this case, my problem solving thought process finally took me to dowels and my drill press. Yes, I have one of those. It’s not large, but it serves my purpose. Combining those two items in my head produced a vision of Tinker Toys. Remember those? My epiphany involved a solution for drilling the right kind, and size, of holes so I could cobble the dowels together, and attach them to each shelf, in the form of small little fences, for tiny little cows and horses. No, really, the fences are to corral cans of food and anything else Diane might want to put on them. Drilling holes in dowels, without drilling all the way through, in a manner that will accommodate the flat end of a dowel requires the use of a forstner bit, of which I have a few. It also required me to build a little jig that would hold the round dowel steady when I drilled it. It punctured me in four places! Really!? I guess I really am thinned skinned. Since I only had a couple more holes to drill, I finished the process then took this picture and showed it to Diane who was busy at her computer. Since she was busy doing something important there I didn’t want to interrupt her by talking so I just held the photo in front of her. She immediately got up and escorted me to the first aid room – we have one of those, now – and fixed me fight up with just one band-aid because two of the small punctures quit bleeding when I scrubbed up so we just left them alone. This entry was posted in Health, Hobbies, Injuries. Bookmark the permalink.